This section is from the book “How To Play Golf“, by Harry Vardon, 1912. Also available from Amazon:How To Play Golf. THE easiest strokes in golf are, I think, shots from the tee with a brassie and from the fairway with an iron. Therefore I would suggest to the beginner, or to the person who is almost resigned to mediocrity, that he should settle down at once to the task of mastering those shots. They are not difficult; but they are impossible unless the player knows how to swing the club properly. The golf swing is different from anything else in sport. It deserves to be called an art. There is only one way of executing it correctly. At least, that is true of its fundamental features. From time to time one hears and reads of various kinds of swings. Years ago, for instance, the talk was all of the St Andrews swing. That swing consists of sweeping the club round the legs until the arms will allow it to go no farther without moving the body, and then bringing the implement back in order to be able to raise it comfortably. To all intents and purposes, it is a matter of going out of the way and having to return to the right track. When the upward swing is three-quarters completed, the adept at the St Andrews method is on the same track as any other proficient golfer at the corresponding stage of the ordinary swing. The latter has simply gone straight to the point, while the devotee of the St Andrews style has taken a round-about route. Sometimes one hears of a good player having a “flat swing.” I venture to say that if the swing is correct, it cannot be “flat.” Again, the expression means that the player starts on a track which he must abandon. A person who never soars above a half-swing may certainly make it a “flat” one, but he will not often be a good golfer. I do not suggest that the afore-mentioned variations in the early part of the full swing are necessarily fatal. What I do say is that they are useless, and that, from three-quarters to the top, and thence to the moment of impact, there is only one proper course for the club-head to follow, and that all accomplished players follow it. It requires a genius to start on the wrong track and get on to the right one. There are people who declare that the perfect way to learn golf is to learn it backwards. That is to say, they advocate a scheme whereby the beginner practises putting for a start, and works his way by a kind of inverted curriculum – the mashie, then the iron, then the cleek– until he studies the full swing with wooden clubs. At first blush, the idea may seem to have something to recommend it. For one thing, it is novel, and a novelty generally possesses a degree of charm. What, however, contributes most to the plausibility of this plan is the fact that the player is taught to hit the ball farther and farther and make his swing longer and longer. There is an appearance of logicality about the notion of beginning in a small way and gradually rising to the glory of long hitting. A little reflection, however, will show that such reasoning is a delusion where the study of golf is concerned. If the short shots were easier than the long ones, it would be all right, but it so happens that approaching is about the most difficult part of the game. As for learning to putt first, I should imagine that anybody would become heartily sick of the business before he had half completed it. I do not know when a person can be said to have learnt putting. There are certain points well worth studying in connexion with it, but there is no infallible prescription for making the ball go into the hole every time – or even every other time. I wish I could discover one. In connexion with the full swing, there are golden rules which can be learnt, and the practice of which will produce success. And it is best, I think, to begin with shots for the practice of which there exist plenty of data. Therefore, let the neophyte, or the player who fears that he is an incurably bad golfer, resolve to master first of all the way of executing a shot off the tee with his brassie. This is the easiest full shot in the realm of golf, and the accomplishment of it always affords a thrill of pleasure and encouragement. Moreover, once he has made himself proficient at it, the knowledge thus acquired will be a considerable help to him in playing the more difficult strokes. I suggest a brassie rather than a driver, because the former, having a slight loft on it, generates the greater amount of confidence. Moreover, as it is the less whippy of these two wooden clubs, it is the simpler to control. The methods of making a shot from the tee and a shot from a good lie on the course are – or should be – identical. The skilled golfer often employs his driver with great effect when the ball lies on the fairway, although, in such circumstances, it is perhaps a little the more difficult club to wield satisfactorily. The beginner cannot do better than seize upon the easiest stroke of all, which is the brassie shot from the tee. Once he is master of it, he will find the driver joyous to use. The two clubs being of the same length (it is important to see that they do not vary in this respect), the driver will be much the same in his hands as the club with which he has been practising. The troublesomeness of its straight face, which at the outset might have been considerable, will be unrecognized now that he feels sure of hitting the ball, and, what is equally important, he will have made a friend of the brassie. The latter is often regarded as the hardest club to use on the fairway. That perhaps is only natural. On the tee, the ball sits up temptingly, entreating a strong blow. On the turf, it seems to be sitting down, and there arises the necessity of picking it up cleanly, and, at the same time, hitting it with all the neatness and power that were inspired by the sight of its shining face raised clear of the ground. Therefore, the player is in every respect well advised in getting on good terms at once with his brassie. Let him have a low tee (the lower, within reason, the better) and, in due course, the driver will present no trouble to him, and the brassie, when he takes it for a shot through the green, will be an old friend. For, as I have already said, the methods of using the two clubs should, under favourable conditions, be exactly the same. When the lie is unfavourable there are certain variations which can be explained later. Hi Don – thanks for taking the time to post your comment. I appreciate it. My Vardon post is not necessarily an example of my overall teaching – certainly wouldn’t give a neophyte a driver and tell them to have a go. 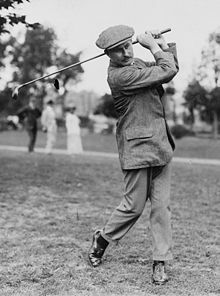 What was most interesting to me was Vardon’s idea that driving is one of the easiest shots in golf. I think that idea deserves some consideration.